Heat Resistant Steel: GX40CrNiSi2512, GX15CrNiSi2520, GX40CrNiSi2520 and GX40CrNiSi3525. Subsequent machining operations after casting. Made in Stainless Steel or high-quality Carbon Steel, SYI Routels/Glass Fittings are used for supporting glass curtain wall system. 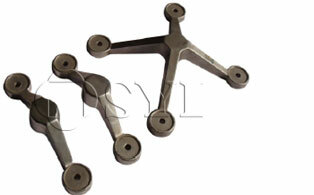 Different accessories like spider clamp routel, bolts, spiders, glass clamps and others are available. Major materials include SS 304 and SS 316. OEM / ODM request is very welcome!